Sekiro: Shadows Die Twice isn’t just another phenomenal action title by FromSoftware, it’s a game that I really needed over these past few weeks. I’ve always struggled to play games when I’ve had some sort of personal turmoil happening in my life. While a lot of people find the comfort of video games to be in how they allow them to escape the real world, for me, I just find it to be a hard medium to dedicate time to when I know that other areas of my life aren’t going well. In the past few weeks that I have been playing Sekiro: Shadows Die Twice, I’ve been encountering this exact issue. For the latter portion of March and now a bit of April, I’ve been having a personal health scare that has left me stressed more than I have been in awhile. To make this clear before I go on any further, I’m completely fine. What has transpired isn’t life-threatening in the slightest and I’m in the process of getting myself fixed with whatever is wrong. Don’t worry. I share this all up front not only to make it clear as to why this review is so late (I’m sorry) but to give you an idea of what my frame of mind has been while playing Sekiro over the past few weeks. Sekiro is a game about death first and foremost. Heck, it’s right there in the title with Shadows Die Twice. But at its core, like so many other FromSoftware titles, it’s a game about overcoming hardships, learning, and adapting to the situations you’ve been presented before continuing onward. Over the past decade or so, FromSoftware has established itself as the premier developer in the realm of action games, and that title hasn’t been lost here with Sekiro. Much like the Souls games before it, Sekiro has a clear vision of how it wants you to approach it and quickly establishes a ruleset of how you are meant to play. This is most clear in the combat of Sekiro, which is easily the game’s best element. 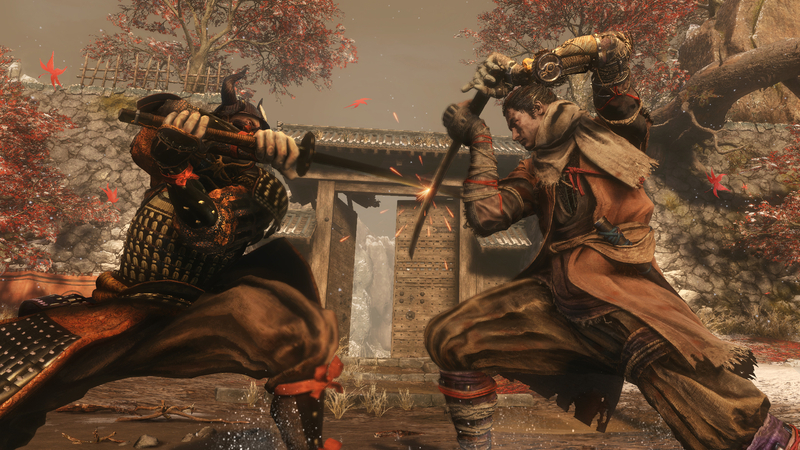 Unlike the Souls games, Sekiro has you engaging in a more precise, dueling style of play that sees you often facing off one versus one with enemies that you come across. It’s much different from games like Bloodborne where you can run around with large two-handed weapons like Ludwig’s Holy Blade and bash foes over the head. No, Sekiro instead asks you to pick and choose your points of attack more so than ever before, but the reward for doing so is arguably greater than any past FromSoftware game. Combat in Sekiro centers entirely around a system known as Posture. Rather than dealing direct damage to an enemy’s health bar with your katana strikes, you’ll instead be working to wear down their Posture bar before then dishing out an immediate killing blow — unless said enemy can withstand more than one of these strikes. I talked a bit about the Posture system in my previous piece with some of my early impressions from Sekiro, but this mechanic has only grown on me the more I have played. What I love about this style of combat that is centered around this tug-of-war with Posture is that it constantly forces you to be the aggressor. Pressing the attack is something I was not used to coming into Sekiro. Past Souls games have taught me to cheese bosses at times more than it has taught me to actually “git gud.” With Sekiro though, it really feels like you have to learn the patterns of your enemies well enough to know both when you can strike and when you can defend. If you don’t stay on top of baddies as well, then their Posture bar will start to reset and you’ll have to grind them down all over again. In typical FromSoftware fashion, Sekiro: Shadows Die Twice‘s best moments come when you must implement what you’ve learned about combat into a boss fight. Boss fights have always been synonymous with FromSoftware and I think Sekiro might offer the studio’s best array of bosses ever. Not only are each of their designs and play styles so varied from one another, but each fight seems to teach you something new that you then need to carry forward with you through the remainder of the game. Whether that’s implementing your character’s prosthetic tools, learning how to parry more effectively, or just simply adapting your own play style on the fly, Sekiro is constantly throwing a wrench into what you think you know and forcing you to then overcome what it is presenting. In a personal situation though where I was struggling to even commit to spending my free time on gaming, I think what I appreciated the most about Sekiro were its moments of elation and victory. If you’ve played a Souls game before, you’re likely very familiar with these instances; the times where you beat your head against a wall for so long only to then finally accomplish the task at hand and advance. While I was playing Sekiro, I sometimes found it difficult to focus on spending so much time dying to bosses, only to keep repeating the process and making no ground. You can get pretty antsy and nervous when you’re sitting around your apartment waiting for MRI results on your brain to come through. Even when I was doing battle with bosses like Lady Butterfly or Genichiro Ashina, instead of trying to pinpoint their attack patterns and strikes, I was miles away focused on things outside of the world of Sekiro. It wasn’t that I wasn’t engaged on what was happening in the game, but more that I was just struggling to even focus. Because of this though, it made those moments where I did lock in and focus on hack-and-slashing these enemies to death feel that much better. The reward and sense of achievement I felt when I did finally beat a difficult boss gave me a much-needed boost in morale during a time where I really needed it. 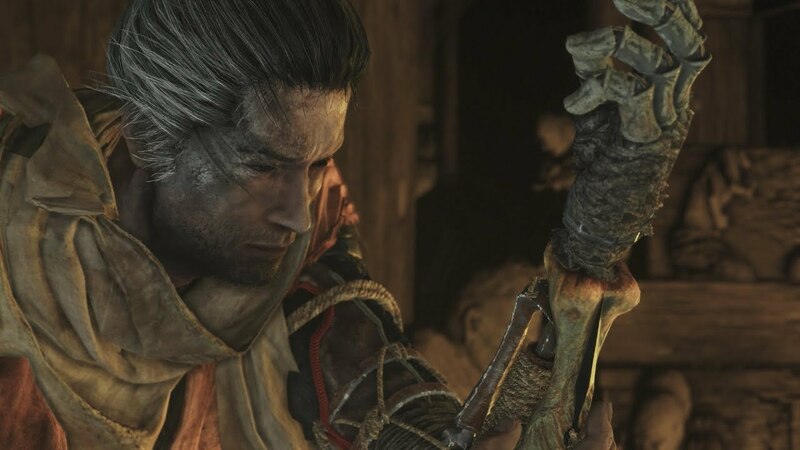 There’s a lot of reasons to like video games, but overcoming these struggles in Sekiro helped remind me of why I like to play games in the first place. This war of attrition and unwillingness to give up in the face of something that seems greater than you while playing Sekiro really helped change my frame of mind during every area other of my life over these past weeks. Sekiro showed up just when I needed it most. When I wasn’t just defeating bosses though after multiple hour struggles, I also fell in love with the world of Sekiro: Shadows Die Twice and the way you can get around it. 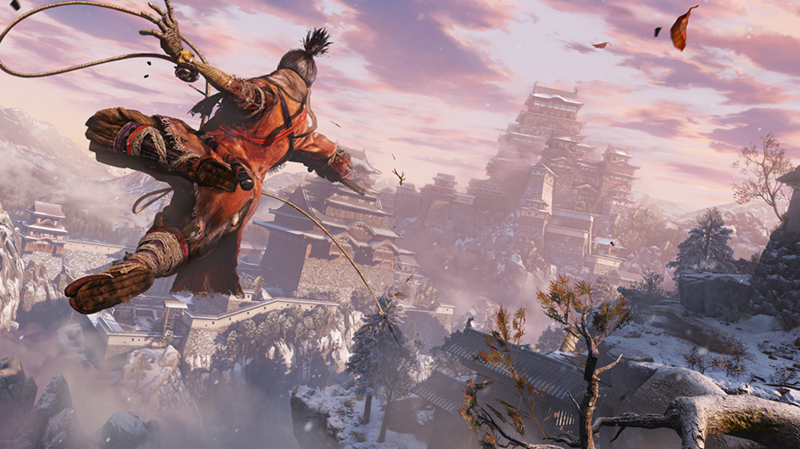 Verticality plays a large role in Sekiro with your character, the One-Armed Wolf, being able to utilize his grappling hook prosthetic arm to vault around to various locations. 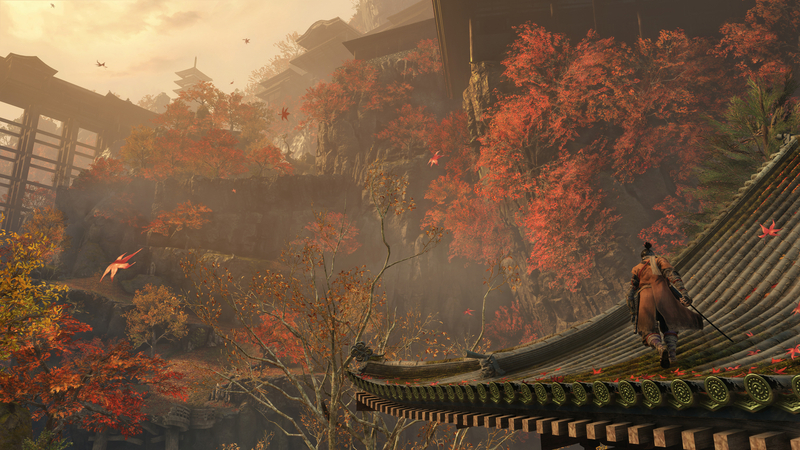 Not only can these newfound vantage points be used to stealthily take out foes, a welcome addition to Sekiro, but it also just allows you to rethink your approach to combat as a whole. For all the praise that FromSoftware has received in the realm of creating great combat and boss encounters in their games over the years, I really do think the studio’s best quality is how it creates these vast, interconnected worlds. The original Dark Souls does a phenomenal job of this, but I think that same design where locations are interwoven in a novel way is on full display here in Sekiro and it’s maybe the studio’s best effort yet. Plus, the locales on display are just really stylized and enjoyable to look at. There are also a few new additions to Sekiro that I really appreciated this time around. For starters, the advent of an actual narrative in the game was more welcome than I thought it’d be. While it’s no BioShock or The Last of Us in terms of storytelling prowess, it was nice to actually have a direct conflict that I understood more than having all of the lore and world-building done through item descriptions. I also have to say that after some initial hesitation, I ended up enjoying the character progression in Sekiro as well. Even though there are a whole lot of different items you need to collect to level up various skills, abilities, health bars, and so on, the way in which you steadily level up over the course of the experience without becoming too overpowered keeps things in check. As much as I love the Souls games, you really can just cheese the progression system by endlessly grinding until you’re so powerful that bosses and other enemies become a breeze to defeat. That never really happens in Sekiro, which is nice because it means you then need actual skill to overcome some of the game’s harder challenges. If there’s really any one aspect of Sekiro: Shadows Die Twice that I have a bone to pick with, it’d be the camera. While the camera in the Souls games have been troublesome in the past, I found what was on display here in Sekiro to be worse than ever before. I think a lot of this stems from the 1v1 nature of many encounters you’re faced with in the game; because you’re focused on single targets so often, the way the camera moves behind you can get awkward and clunky at times. Specifically, when you’re pressed up too close to a wall, you’ll immediately lose track of your character and be forced to stop locking on to your foe and get away from the wall. I died to a boss more than once in Sekiro purely because I couldn’t see what was happening at a given time. This game is already hard enough as it is and I didn’t need the difficulty to be amplified even further because of a troublesome camera. From top to bottom, Sekiro: Shadows Die Twice is another winner for FromSoftware, a studio that I truly believe is the best in the entire video game industry right now. To continue to deliver time and time again with such high-quality products like this is rarely seen, and the studio deserves endless praise for such. Even though the shift in formula from past Souls ventures was questionable at first, FromSoftware has proven with Sekiro that whatever they might decide to do in the future will likely continue to be excellent. More than anything though, Sekiro is a game that I am endlessly thankful for having spent time with the past few weeks. The moments of elation that I have had playing through Sekiro were unmatched not only in gaming but in my everyday life. It provided a sense of joy that comforted me and made me optimistic when I needed it most. Sekiro: Shadows Die Twice is a game I will continue to look back at fondly for years to come because of this.